RNA silencing processes are widespread in almost all eukaryotic organisms. They have various functions including genome protection, and the control of gene expression, development and heterochromatin formation. RNA interference (RNAi) is the post-transcriptional destruction of RNA, which is mediated by a ribonucleoprotein complex that contains, among several components, RNA helicases and Argonaute proteins. RNAi is functional in trypanosomes, protozoan parasites that separated very early from the main eukaryotic lineage and exhibit several intriguing features in terms of the control of gene expression. In this report, we investigated the functions of RNAi in Trypanosoma brucei. By searching through genome databases, novel Argonaute-like proteins were identified in several protozoa that belong to the kinetoplastid order, a group of organisms that diverged early from the main eukaryotic lineage. T. brucei possesses two Argonaute-like genes termed TbAGO1 and TbPWI1. Dual transient transfection assays suggest that TbAGO1, but not TbPWI1, is involved in RNAi. The entire coding region of TbAGO1 was deleted by double gene knockout. TbAGO1-/- cells turned out to be completely resistant to RNAi generated either by transfected double-stranded RNA or by expression of an inverted repeat. TbAGO1-/- cells were viable but showed a dramatically reduced growth rate. This was probably due to defects in mitosis and abnormal chromosome segregation as revealed by in situ analysis. The RNAi and growth phenotypes were complemented by the inducible expression of a GFP::TbAGO1 fusion protein that revealed the cytoplasmic location of the protein. The requirement of TbAGO1 for RNAi in trypanosomes demonstrates the evolutionary ancient involvement of Argonaute proteins in RNAi silencing processes. RNAi-deficient TbAGO1-/- cells showed numerous defects in chromosome segregation and mitotic spindle assembly. We propose a working hypothesis in which RNAi would be involved in heterochromatin formation at the centromere and therefore in chromosome segregation. RNA silencing includes a wide range of post-transcriptional phenomena in eukaryotes, such as post-transcriptional gene silencing in plants , quelling in fungi , homology-dependent gene silencing in ciliates  and RNA interference (RNAi) in animals . The latter is a process in which the presence of double-stranded RNA (dsRNA) of a given sequence induces the rapid, efficient and specific degradation of the mRNA with the corresponding sequence. In most cases, long dsRNA is fragmented into 21 – 26 bp dsRNAs, termed short interfering RNAs (siRNAs) , by the action of Dicer, a type III ribonuclease . These siRNAs are part of an enzymatic complex that scan RNA and target those with the identical sequence to that of the siRNAs for destruction. Other types of proteins involved in RNAi include RNA helicases, Argonaute proteins, and, in some species, RNA-dependent RNA polymerases . Mechanistic aspects of RNA silencing are remarkably well conserved among organisms as diverse as protists, fungi, plants and animals, indicating that it has important functions. One such function appears to be the protection of the genome from unwanted nucleic acids, such as those expressed by viruses in plants [8, 9], or those originating from transposons [10, 11]. Additional functions have been unveiled, such as the control of gene expression during development , genome rearrangement in ciliates [13, 14] and the formation of heterochromatin and control of gene expression in plants and fission yeast [15–17]. Trypanosomes are protozoan parasites belonging to the order Kinetoplastida, which diverged very early from the main eukaryotic lineage. These unicellular organisms are responsible for several tropical diseases including sleeping sickness in central Africa, which is caused by the species Trypanosoma brucei. This species is found alternately in the digestive tract of an insect vector, the tsetse fly, and the bloodstream of a mammalian host. It adapts to these different environments by activating specific programs of differentiation . Trypanosomes develop as extracellular parasites and escape the host immune response by means of a sophisticated process of antigenic variation. Their surface is entirely covered by a dense coat composed of a single type of molecule, the variant surface glycoprotein (VSG). Trypanosomes possess several hundreds of VSG genes scattered throughout their genome but these can only be expressed from one of ~20 expression sites, with only a single site being active at one time . Trypanosomes were among the first organisms in which RNAi was identified. RNAi was detected in mutants expressing dsRNA of genes coding for the paraflagellar rod A protein (PFRA)  and for tubulin . RNAi was rapidly exploited as a powerful tool for the study of gene function [22–26]. As in other organisms, long dsRNAs are degraded into siRNAs and incorporated into a ribonucleoprotein complex . About 10 – 20 % of siRNAs are associated with translating polyribosomes, suggesting a possible interaction between RNAi and the translation machinery . Cloning and sequencing of trypanosome siRNA has revealed a large number of endogenous short RNAs corresponding to the INGI and SLACS retroposon elements, suggesting that one function of RNAi could be the control of mobile genetic elements . Interestingly, such mobile elements are missing from the genome of the related parasite Leishmania, where RNAi does not seem to be functional . To evaluate the role of RNAi in the control of gene expression and in the general biology of trypanosomes, we searched for molecular components of the RNAi machinery and investigated their function. We identified two Argonaute proteins, TbAGO1 and TbPWI1 and demonstrate that the first is essential for RNAi. Moreover, we show that cells deprived of TbAGO1 display numerous defects in chromosome segregation and mitotic spindle assembly. Finally, we propose a working model to explain the observed results. In order to investigate RNAi functions in trypanosomes, we first searched candidate genes potentially involved in this mechanism. We screened various protist genome databases with the sequence of genes known to be involved in RNAi in other organisms. The genomes analysed were from T. brucei, T. cruzi and Leishmania major (all belonging to the order Kinetoplastida), from Giardia lamblia and from Plasmodium falciparum. Two distinct Argonaute-like proteins, TbAGO1 and TbPWI1, were identified in T. brucei whereas single proteins were found in G. lamblia (GlAGO1), T. cruzi (TcPWI1) and L. major (LmPWI1). Searches through the complete genome sequence of P. falciparum failed to identify any Argonaute-like genes. These proteins were examined for the presence of motifs and aligned with other members of the Argonaute protein family from several eukaryotic species (Fig. 1A). TbAGO1 is a protein of 892 amino acids, with a calculated molecular weight of 98015 Da and with an estimated pI of 9.18. It possesses a PAZ and a Piwi domain, typical signatures of Argonaute proteins . The Piwi domain shows 20 – 31 % homology with Piwi domains of Argonaute proteins from other species (see Additional file: 1), whereas the PAZ domain shows weaker conservation. In addition, TbAGO1 contains an amino-terminal RGG box (a nucleic acid-binding domain), with 10 copies of the arginine-glycine-glycine motif. This feature has not been observed previously in Argonaute proteins from other species. However, detailed analysis of the poly-glutamine (poly-Q) box present at the amino-terminal end of the Arabidopsis thaliana AGO1 protein revealed the presence of five copies of the RGG motif (Fig. 1B). Argonaute-like proteins in protists. A. Schematic representation of Argonaute-like proteins. TbAGO1, Trypanosoma brucei AGO1 (accession number AY433802); TbPWI1, Trypanosoma brucei PWI1 (AY433803); LmPWI1, Leishmania major AGO1 (AL446005); GlAGO1, Giardia intestinalis AGO1 (AY142143); SpAGO1 Schizosaccharomyces pombe AGO1 (CAA19275); TtTWI1 Tetrahymena thermophila TWI1 (AB084111); AtAGO1, Arabidopsis thaliana AGO1 (U91995), CeRDE1, Caenorhabditis elegans RDE1 (AF180730); NcQDE2, Neurospora crassa QDE2 (AF217760); DmAGO2, Drosophila melanogaster AGO2 (NM168626). The red and yellow boxes indicate PAZ and Piwi domains respectively. The TbAGO1 RGG box is shown in green, the DmAGO2 poly-Q box is shown in blue and the N-terminal extension of AtAGO1 is annotated as a poly-Q box but also containing RGG motives and is shown in blue and green. B. Amino-terminal extensions of TbAGO1 and AtAGO1 contain RGG boxes. The RGG motifs are shown in red and the poly-Q box in blue. C. TbAGO1 and TbPWI1 RNA are expressed in the culture-adapted procyclic stage of T. brucei. Total RNA extracted from wild-type trypanosomes was incubated with (+) or without (-) reverse transcriptase and PCR-amplified using specific primers for the indicated genes. TbPWI1 and LmPWI1 contain a typical Piwi domain, but no PAZ domain could be recognised. Neither possesses an RGG box. These two proteins show high homology in their Piwi domain (55.4% identity), with a specific insertion that is not found in Argonaute proteins from other organisms (see supplementary data). We explored whether TbAGO1 and TbPWI1 are involved in RNAi silencing in T. brucei. 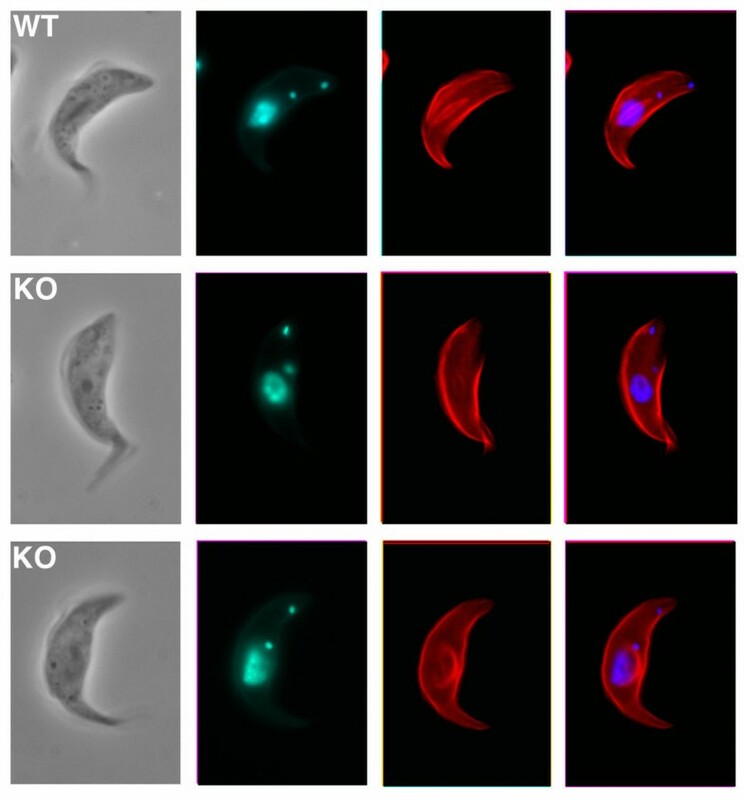 Since trypanosomes display different life cycle stages, each with a specific pattern of protein expression, we first checked whether TbAGO1 and TbPWI1 were expressed in the procyclic culture stage used for this study. Real time PCR analysis (Fig. 1C) showed that RNA for both TbAGO1 and TbPWI1 were expressed in this stage. To evaluate the possible participation of TbAGO1 and TbPWI1 in RNAi in trypanosomes, we used a double transient transfection assay as developed in Drosophila [6, 31]. Trypanosomes were first transfected with dsRNA targeting RNA coding for proteins potentially involved in RNAi and returned to culture for 10 h. To evaluate the consequences of silencing the candidate protein on the behaviour of the RNAi machinery, a second dsRNA targeting a marker gene was introduced. We selected the PFRA gene as a marker: this gene codes for an abundant flagellar protein that is essential for cell motility . Loss of PFRA via RNAi produces a viable and obvious paralysis phenotype that can easily be monitored by immunofluorescence [22, 32]. Candidate genes included TbAGO1 and TbPWI1, as well as green fluorescent protein (GFP) as a control. 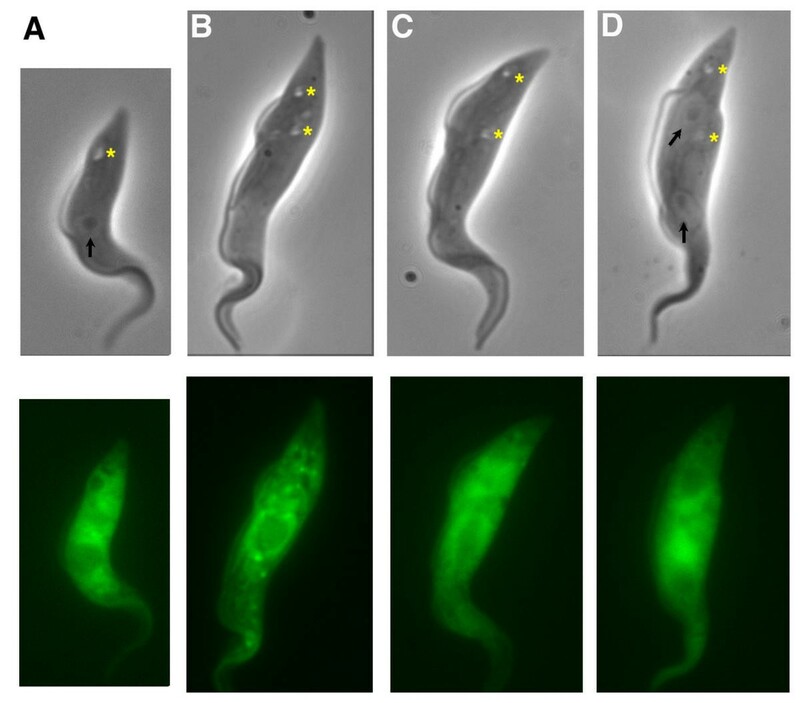 Transfection of GFP dsRNA did not modify the ability of PFRA dsRNA to subsequently silence PFRA expression, producing the usual number of paralysed trypanosomes (Fig. 2A). In contrast, the introduction of TbAGO1 dsRNA led to a five-fold reduction in the efficiency of RNAi generated by PFRA dsRNA. Electroporation of TbPWI1 dsRNA led to normal PFRA silencing (Fig. 2A). These results were reproduced six times, including with two different markers (tubulin and flagellum adhesion glycoprotein-1 [FLA1]). These data suggest that TbAGO1, but not TbPWI1, is involved in RNAi. TbAGO1 is required for RNAi in transient transfection assays. A. Wild-type trypanosomes were first electroporated with dsRNA corresponding to the indicated genes, returned to culture for 10 h and then transfected with PFRA dsRNA. Samples were fixed 15 h later and cells exhibiting PFRA silencing were identified by immunofluorescence using an anti-PFRA specific monoclonal antibody. The experiment was repeated six times, yielding similar results. 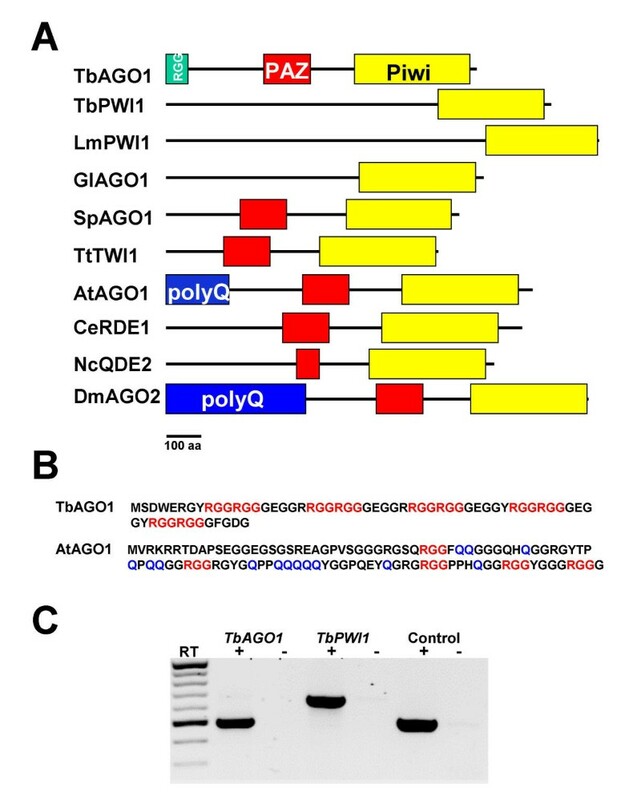 B. FACS analysis of trypanosomes transformed with plasmid pGFPTbAGO1430 grown in the absence (non-induced; thin green line) or in the presence of tetracycline (induced; thick lines). Induced cells were not transfected (thick green line) or transfected with TbAGO1 dsRNA (thick red line) or with TbGRP1 dsRNA as negative control (thick blue line). GFP::TbAGO1 protein levels were monitored by FACS analysis. Only TbAGO1 dsRNA was able to reduce GFP::TbAGO1 fluorescent protein levels (notice shift of thick red line compared to blue or green thick lines). Cells were transfected with the PFRA dsRNA 10 h later and PFRA silencing was monitored as above (inset). This experiment was carried out twice and yielded similar results. To confirm that the observed reduction in RNAi silencing activity was due to the knockdown of TbAGO1 RNA and protein, we generated a cell line expressing TbAGO1 fused to GFP under the control of a tetracycline-inducible promoter (Fig. 3A). We fused the GFP gene upstream of TbAGO1 as downstream fusions have turned out to be non-functional in other organisms . This construct allows monitoring of the TbAGO1 silencing effect by visualisation of the GFP::TbAGO1 fluorescent protein. The cell line expressing the GFP::TbAGO1 protein was transfected with TbAGO1 dsRNA or with dsRNA from the unrelated TbGRP1 gene as control. GFP dsRNA could not be used as a control in this experiment as the GFP gene was fused to TbAGO1. Cells were returned to culture for 10 h and then transfected with PFRA dsRNA. FACS analysis revealed a ~10-fold reduction of GFP::TbAGO1 fluorescence after introduction of TbAGO1 dsRNA, confirming that TbAGO1 is at least partially silenced during the assay (Fig. 2B). In these conditions, PFRA silencing was strongly diminished (Fig. 2B, inset), reproducing the results obtained with wild type (WT) cells (Fig. 2A). In contrast, cells electroporated with the control TbGRP1 dsRNA did not show any reduction in their GFP::TbAGO1 fluorescence signal compared with untransfected controls, and subsequent introduction of PFRA dsRNA produced the usual PFRA silencing effect (Fig. 2B). These data indicate that the observed inhibition of RNAi silencing was indeed due to the reduction in TbAGO1 abundance. Generation of TbAGO1-/- (KO) and TbAGO1-/- +GFP::TbAGO1 Ti cell lines. A. Schematic representation of the endogenous TbAGO1 locus (top), and of the constructs used for double TbAGO1 knock-out (middle) and for expression of GFP::TbAGO1 fusion protein (bottom). Large and small boxes represent protein coding sequences and TbAGO1 flanking regions used for the knockout construct. The tetracycline-inducible EP promoter of the pGFP::TbAGO1430 vector is indicated by a star. B. Southern blot analysis showing the absence of TbAGO1 from the TbAGO1-/- (KO) cell line. Genomic DNA was purified from the indicated cell lines, digested with Sca I and Xba I, and fragments were separated and transferred on a nylon membrane for hybridisation with a TbAGO1 probe. C. Northern blot analysis. Total RNA (10 μg) from the indicated cell lines was run on a gel and transferred onto a nylon membrane for hybridisation with a TbAGO1 probe (top panel) or with an α-tubulin probe (central panel). The bottom panel shows ethidium bromide staining of the membrane after transfer. Since RNAi effects rarely last more two generations under these conditions, the transient nature of this type of experiment, and the difficulty of using RNAi silencing to study RNAi processes restricted further investigation. Having demonstrated the importance of TbAGO1 for RNAi, we decided to delete TbAGO1 by double gene knockout. Data from the T. brucei genome sequencing project, as well as our Southern blotting analysis (data not shown) showed that TbAGO1 is a single copy gene. As trypanosomes are diploid organisms, we produced two separate constructs for targeted gene replacement of the whole coding sequence of TbAGO1 by the drug resistance markers blasticidin S deaminase (BSD) and neomycin phosphotransferase (NEO) (Fig. 3A). The first allele of TbAGO1 was replaced by the BSD marker before the obtained cell line was transfected with the NEO construct to replace the second allele. Viable double-resistant cells were obtained and further characterised. Southern blotting (Fig. 3B) and PCR analysis (data not shown) of genomic DNA from the double-resistant cells confirmed that both constructs had integrated at the expected locus and that all endogenous copies of TbAGO1 had been deleted. The cell line was subcloned and termed TbAGO1-/-. TbAGO1-/- cells were further transfected with plasmid pGFPTbAGO1430 for expression of the fusion protein GFP::TbAGO1 in order to attempt functional complementation experiments (Fig. 3A). As the GFP::TbAGO1 fusion gene in this plasmid is expressed via a tetracycline-inducible promoter, we further transformed these cells with plasmid pHD360  that expresses the tet-repressor, allowing tetracycline-inducible control of expression of GFP::TbAGO1. The cell line was named TbAGO1-/-+GFP::TbAGO1 Ti . Northern blotting analysis confirmed that the GFP::TbAGO1 RNA was expressed in the presence of tetracycline (Fig. 3C). 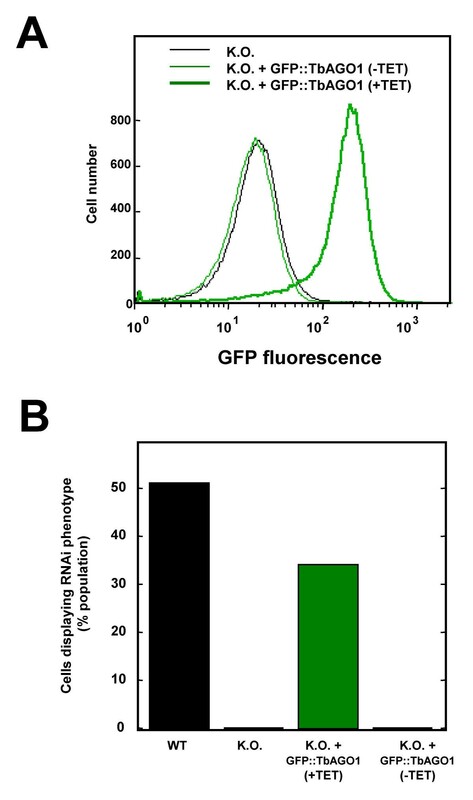 Fluorescence-activated cell sorter (FACS) analysis demonstrated that the GFP::TbAGO1 protein was only expressed in the presence of tetracycline (Fig. 4A). TbAGO1-/- cells are resistant to RNAi. A. FACS profile of TbAGO1-/- (KO), or of TbAGO1-/- +GFP::TbAGO1 Ti cells grown in the absence (-TET, non-induced, thin green lines) or in the presence of tetracycline (+TET, induced, thick green lines). B. The indicated cell lines were transfected with PFRA dsRNA and returned to culture for 15 h before fixation and monitoring of the RNAi phenotype by immunofluorescence. To determine the involvement of TbAGO1 in RNAi, WT, TbAGO1-/- and TbAGO1-/-+GFP::TbAGO1 Ti cells grown either in the presence or absence of tetracycline were transfected with PFRA dsRNA (Fig. 4B) or with tubulin dsRNA (data not shown). Immunofluorescence analysis with a PFRA-specific antibody failed to detect a single cell with reduced PFRA abundance. Therefore, RNAi silencing was completely abolished in the knockout cell line, demonstrating that TbAGO1 was essential for RNAi. A similar result was observed in the TbAGO1-/-+GFP::TbAGO1 Ti cell line as long as the fusion protein was not expressed. 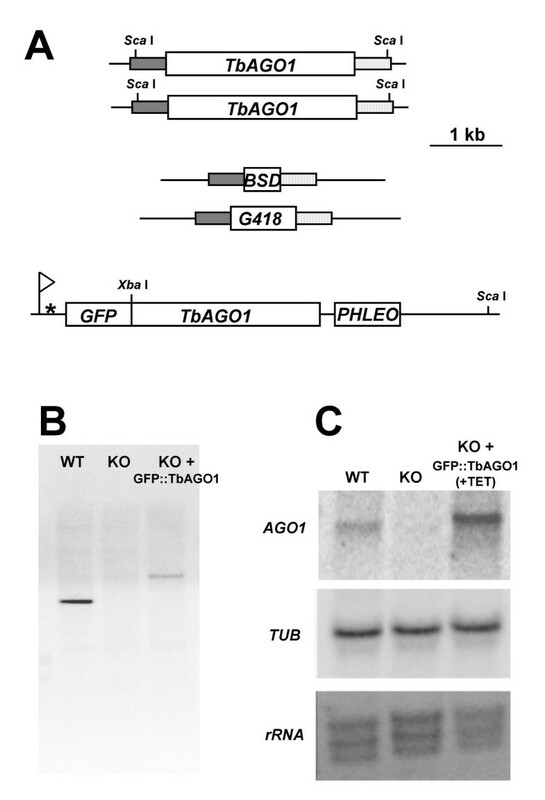 In contrast, expression of GFP::TbAGO1 was sufficient to restore PFRA silencing (Fig. 4B), therefore complementing the phenotype and confirming that TbAGO1 is required for RNAi in trypanosomes. Similarly, when TbAGO1-/- cells were transfected with plasmid pααPFRA430, expressing a PFRA dsRNA as a hairpin , no PFRA silencing at all could be observed (data not shown). These data demonstrate that TbAGO1 is required for RNAi generated both by endogenously-expressed hairpin dsRNA and by exogenously dsRNA synthesised in vitro. Although TbAGO1-/- cells were viable, they showed reduced growth rate and morphological defects. 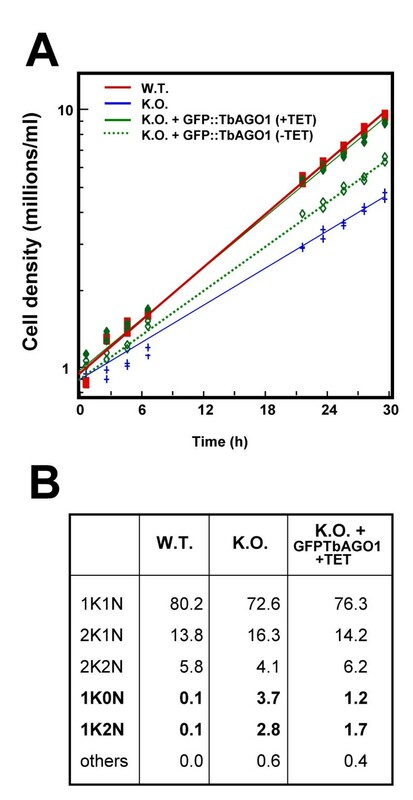 The doubling time of the knockout cell line was ~15 h as opposed to 8–9 h for WT or complemented cells (Fig. 5A). In an effort to understand the reduced growth rate of mutant cells, we monitored their cell biological behaviour. During the cell cycle, trypanosomes need to replicate two single unit genomes: the nuclear and the mitochondrial genomes . Trypanosomes possess a single mitochondrion, the kinetoplast, which contains a large DNA network that is visible under light microscopy. The kinetoplast duplicates first, followed by the nucleus, defining three cell cycle stages: cells with one kinetoplast and one nucleus (1K1N), cells with two kinetoplasts and one nucleus (2K1N) and cells with two kinetoplasts and two nuclei (2K2N) [35, 36]. Cultures of TbAGO1-/- cells showed normal proportions of these three sub-populations compared to WT or TbAGO1-/-+GFP::TbAGO1 Ti cells grown in the presence of tetracycline (Fig. 5B), despite the presence of discrete modifications. However, TbAGO1-/- cultures exhibited a >30-fold increase in the proportion of cells with one kinetoplast but with no nucleus, also called zoids [37, 38], and a >20-fold increase in the proportion of cells with one kinetoplast but with two nuclei (Fig. 5B). These cell types are rare in normal, healthy cultures and are the consequences of a defect in nuclear mitosis. The classic nuclear mitosis / cytokinesis checkpoint is absent in trypanosomes, where cytokinesis is linked to kinetoplast duplication and segregation . Therefore cells with delayed nuclear mitosis that have managed to duplicate and segregate their kinetoplasts can undergo cytokinesis to produce one daughter cell without a nucleus but with a kinetoplast and another daughter cell with a kinetoplast and one or two nuclei, if mitosis can be completed. TbAGO1-/- cells show delayed growth rate and abnormal cell types. A. Growth curve of wild type (W.T., red squares), TbAGO1-/- (K.O., blue crosses), or of TbAGO1-/- +GFP::TbAGO1 Ti cells grown in the absence (-TET, non-induced, open diamonds and dotted green line) or in the presence of tetracycline (+TET, induced, closed diamonds and full green line). B. Analysis of cell types within populations of wild-type (W.T. ), TbAGO1-/- (K.O. ), or of TbAGO1-/- +GFP::TbAGO1 Ti cells grown in the presence of tetracycline (K.O.+GFP::TbAGO1+TET). 1K1N, cells with one kinetoplast and one nucleus; 2K1N, cells with two kinetoplasts and one nucleus; 2K2N, cells with two kinetoplasts and two nuclei; 1K0N, cells with one kinetoplast but without nucleus (zoids) and 1K2N, cells with one kinetoplast and two nuclei. More than 1 000 cells were counted per experiment. These results indicate potential mitosis defects in TbAGO1-/- cells. We therefore examined the state of mitotic cells in cultures from WT, TbAGO1-/- and TbAGO1-/-+GFP::TbAGO1 Ti cells grown in the presence of tetracycline (Fig. 6). Trypanosomes were fixed and stained with 4',6'-diamidino-2-phenylindole (DAPI) to visualise kinetoplast and nuclear DNA and with the anti-tubulin KMX-1 antibody to identify the mitotic spindle. In WT trypanosomes, mitotic cells are identified by the presence of a large nucleus and two well-separated kinetoplasts (2K1N cells). The mitotic spindle is easily recognisable, stretching in the direction of the long axis of the cells (Fig. 6, top panel). The vast majority of such 2K1N wild-type cells displayed a normal spindle (Table 1), as expected from previous observations . In contrast, more than 20 % of the TbAGO1-/- cells at the 2K1N stage did not possess a recognisable spindle at all, and of those with a spindle, almost half displayed various abnormalities (Fig. 6 and Table 1). In many cases, the spindle was not fully assembled and failed to show the typical elongation seen in WT trypanosomes. For example, the TbAGO1-/- cell shown on the central panel of Fig. 6 is at the same stage of its cell cycle as its WT counterpart shown on the top panel, judging from the distance separating the two kinetoplasts. Intriguingly, in the knockout cell, the spindle was barely formed, being very short and with no recognisable spindle poles when compared with the WT cell in the top panel. Another frequent defect was the presence of a large bent spindle, showing a bundle of microtubules present on only one side of the nucleus (Fig. 6, bottom panel). In several cases, the DNA staining pattern of the mitotic nucleus also looked unusual. Instead of a large, relatively homogenous amount of DNA (trypanosome chromosomes do not condense at mitosis), patches of disperse intense staining were frequently observed (Fig. 6, central panel). Spindle formation is frequently aberrant in TbAGO1-/- cells. 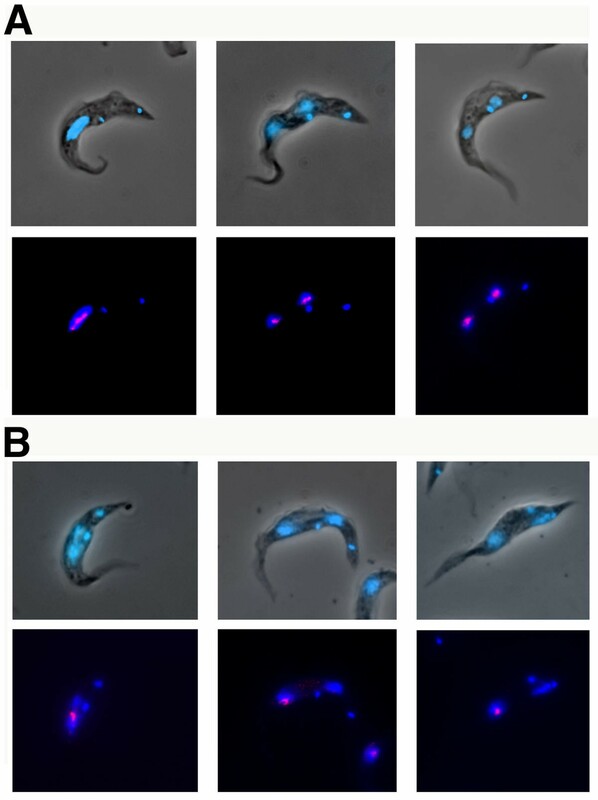 Trypanosomes were stained with the anti-tubulin KMX-1 monoclonal antibody and counterstained with DAPI to show nuclear and mitochondrial DNA. Mitotic cells from wild type (WT, top panels) or TbAGO1-/- (KO, central and bottom panels). From left to right, phase contrast image, DAPI staining (blue), tubulin staining (red) and merged DAPI and tubulin staining. The typical elongated mitotic spindle found in wild-type trypanosomes is frequently poorly developed (central panels) or completely bent on one side of the nucleus (bottom panels) in TbAGO1-/- cells. Proportion of various aberrant cell types. The above data suggest significant mitotic defects in the TbAGO1-/- cell line. To assess whether nuclear segregation was complete, we used the monoclonal antibody L1C6, which recognises an unknown antigen localised to the nucleolus (L. Kohl and K. Gull, unpublished observations). In trypanosomes, the nucleolus is not dispersed at mitosis, which is intranuclear, but it is segregated along the mitotic spindle. In non-mitotic WT cells, this antibody stained the nucleolus, producing one bright spot per nucleus (data not shown). During early anaphase, the signal looked like a bright bar (Fig. 7A, left), corresponding to the nucleolus that is being segregated, since the nucleolus and nuclear membrane remain present throughout the trypanosome cell cycle. At telophase, both nuclei contained a well-defined nucleolus, recognisable as a bright spot (Fig. 7A, centre and right). Observation of binucleated cells of the TbAGO1-/- mutant revealed that one third of them displayed unequal distribution of the L1C6 nucleolar marker, suggesting that nuclei did not inherit the same amount of nucleolar material (Table 1 and Fig. 7B). In some cells, spots of staining appeared in the cytoplasm between the two nuclei, suggesting delayed or lost material (Fig. 7B, central panels). In addition, DAPI staining showed that the two nuclei often had different morphologies (Fig. 7B, right panels). Nucleolus segregation is not equal in TbAGO1-/- cells. Immunofluorescence of trypanosomes stained with the anti-nucleolus marker L1C6 monoclonal antibody and counterstained with DAPI to show nuclear and mitochondrial DNA. A. Wild-type trypanosomes, B. TbAGO1-/- trypanosomes. In both cases, the top series shows a phase contrast image superimposed onto the DAPI image (blue), and the bottom series shows the DAPI image (blue) merged with nucleolus staining (red). Left panels, cells at the anaphase stage of nuclear mitosis. Middle and right panels, cells at the telophase stage of nuclear mitosis. In wild-type cells (A), both nuclei inherit similar amounts of nucleolar material, whereas clear differences are visible between the two nuclei in a large number of binucleated cells from the TbAGO1-/- mutant (B). Further observations of DAPI staining in binucleated cells from the TbAGO1-/- mutant revealed the presence of lagging DNA material during mitosis (Fig. 7B and data not shown). These data suggest possible difficulties in chromosome segregation, a defect previously reported in yeast RNAi mutants [40, 41]. To evaluate this possibility, we performed fluorescence in situ hybridisation (FISH), using a probe recognising the tandem repeats of 5S ribosomal DNA, to visualise chromosome I at mitosis . In WT trypanosomes, two spots could be identified in G1 cells (Fig. 8A). Progression through mitosis can be monitored by DAPI staining using both nuclear and mitochondrial genomes as markers . In early (Fig. 8B) and late (Fig. 8C) anaphase, WT cells showed four spots migrating towards the spindle poles, reproducing published findings . In contrast, this pattern was frequently modified in TbAGO1-/- mitotic cells (Fig. 8D,8E,8F). Judging from the distance separating the two kinetoplasts, the TbAGO1-/- cell shown in Fig. 8D is at the same stage of the cell cycle as its WT counterpart presented in Fig. 8B. However, chromosome I segregation appeared to be delayed, with all the chromosomes found in the centre of the mitotic spindle. This defect was the most frequent in TbAGO1-/- mitotic cells. In other cases, unequal chromosome segregation was observed, with three chromosomes migrating towards one pole of the spindle and only one towards the opposite pole (Fig. 8E). In more remarkable cases, DAPI staining revealed the presence of several DNA entities containing variable numbers of chromosome I (Fig. 8F). These data strongly suggest that, in addition to spindle formation defects and to nucleolar segregation defects, chromosome segregation is also affected in the absence of TbAGO1. Taken together, these data indicate that the growth delay measured in the TbAGO1-/- mutant is very likely to be due to a mitotic defect and suggest a possible involvement of the RNAi machinery in this process. Chromosome segregation is modified in TbAGO1-/- cells. Wild-type (A-C) and TbAGO1-/- (D-F) cells were fixed and processed for FISH using a probe for the 5S tandem repeats, localised on chromosome I and stained with DAPI. 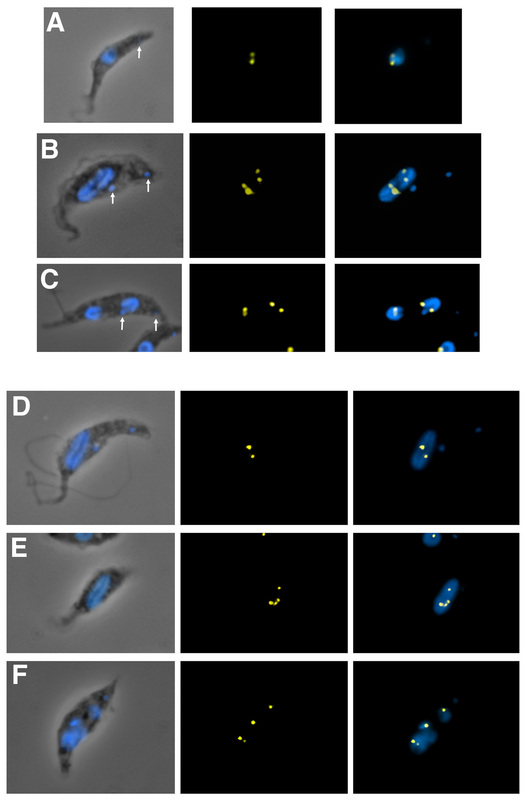 Left, phase-contrast image merged to DAPI (blue), middle, chromosome I signal (yellow) and right, merged DAPI-FISH signals. A. G1 cell; B-F. Mitotic cells. Defects in chromosome segregation are frequently observed in mutant cells. Finally, as the GFP::TbAGO1 fusion protein is functional as it is able to complement the double mutant, it can be used as a tool to determine TbAGO1 localisation. Direct observation of live TbAGO1-/-+GFP::TbAGO1 Ti cells grown in the presence of tetracycline without any fixative under the microscope revealed that the GFP::TbAGO1 fusion protein was mostly cytoplasmic (Fig. 9). However, some redistribution seemed to occur at mitosis, when the protein was concentrated around the nucleus and it was spread between the two nuclei at the end of mitosis. A similar distribution was observed at different levels of induction, irrespective of the amount of GFP::TbAGO1 fusion protein present. GFP::TbAGO1 is localised in the cytoplasm. Live cells from cell line TbAGO1-/- +GFP::TbAGO1 Ti were observed by phase contrast (top panels) or by direct GFP fluorescence (bottom panels, images were not digitally enhanced). The position in the cell cycle can be evaluated by the number and position of flagellar pockets (indicated by yellow stars) and the distance separating them. Arrows indicate the position of the nucleolus (dark spot within the nucleus). A. Cell with one kinetoplast and one nucleus. B, C. Cells with two kinetoplasts and one mitotic nucleus. D. Post-mitotic cell with two kinetoplasts and two nuclei. Searches through protist genome databases identified four novel Argonaute protein members: TbAGO1 and TbPWI1 in T. brucei, TcPWI1 in T. cruzi, LmPWI1 in L. major and GlAGO1 in G. lamblia. These protists belong to the orders Kinetoplastida and Diplomononida, which diverged very early from the main eukaryotic lineage, revealing the ancient origin of the Argonaute proteins. Since genome sequencing of these organisms has not yet been completed, other members of the Argonaute family may be uncovered. We could not identify any Argonaute protein in the database of P. falciparum or in other Plasmodium species, although genome sequencing is complete. Plasmodium is a parasite that belongs to the apicomplexan group that appeared later than kinetoplastids in evolution. It is possible that Argonaute proteins have been lost in this group, as they have in the budding yeast Saccharomyces cerevisae . Alternatively, they could have diverged too much to be recognised by conventional BLAST searches, especially since the genome of Plasmodium species is AT-biased. All four proteins contained a typical Piwi domain , one of the signatures of the Argonaute protein family. The function of this domain is unknown but deletion experiments in mammalian cells suggest that it could be involved in interactions with the type III ribonuclease Dicer . The PAZ motif usually shows weaker conservation [13, 45] and could only be unambiguously identified in TbAGO1. The function of this domain is also unknown, although interestingly, it is present in Dicer . The PRP motif, identified in the mammalian Argonaute subfamily eIF2C , could not be found in any of the four protist Argonaute proteins, suggesting that it appeared later in the evolution of multicellular organisms. In addition to PAZ and Piwi domains, TbAGO1 possesses an RGG box, containing 10 copies of the arginine-glycine-glycine motif in the first 60 amino acids. This motif is involved in nucleic acid binding and has been identified in numerous proteins including nucleolin and the helicase Vasa. RNA binding proteins bearing RGG motifs have already been identified in the T. brucei proteins NOP40/44, a nucleolar protein  and the mitochondrial protein RBP16 . In the latter case, extensive arginine methylation of RBP16 has been demonstrated, although its function remains to be determined . 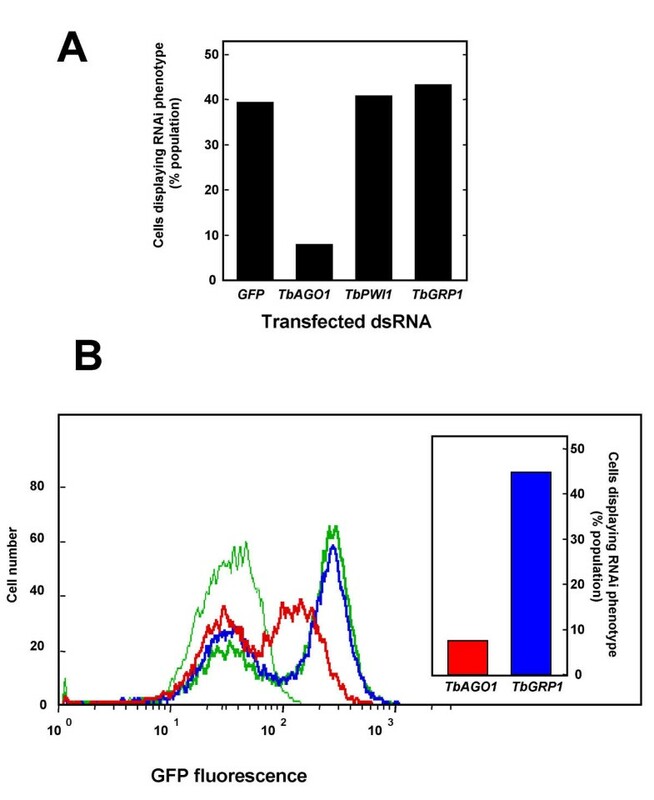 Dual transient transfection assays and TbAGO1 gene deletion followed by transformation or endogenous expression of dsRNA clearly demonstrated that TbAGO1, but not TbPWI1 is required for RNAi. This shows that the two proteins are not redundant, since TbPWI1 could not substitute for TbAGO1 in any of the RNAi assays we used. Similarly, inactivation of Caenorhabditis elegans RDE1 abolishes RNAi completely despite the presence of at least 22 other Argonaute members in the genome [11, 12]. Interestingly, Leishmania is not able to carry out RNAi  and possesses only a single Argonaute gene, LmPWI1 that is much closer to TbPWI1 than to TbAGO1. A role for Argonaute proteins in RNA silencing processes has been shown in C. elegans , Neurospora crassa  and A. thaliana  by direct mutagenesis, and in D. melanogaster after purification of a ribonucleoprotein complex involved in RNAi, followed by functional characterisation in double transient transfection assays . Involvement of the four mammalian Argonaute proteins of the eIF2C subfamily has also been shown by double transfection assays, this time using siRNA . Trypanosomes are the first organisms for which a full knockout of an Argonaute protein involved in RNAi has been reported. It is not yet clear how Argonaute proteins participate in RNAi. It should be noted that three of the Argonaute proteins proven to be involved in RNAi (AtAGO1, DmAGO2 and TbAGO1) possess amino-terminal extensions. The RGG box of TbAGO1 could be involved in RNA binding activities, supporting the hypothesis that Argonaute proteins could retain RNA molecules in the RNAi complex [28, 50]. Interestingly, several RGG motifs are also present in the poly-Q box of A. thaliana (Fig. 1B), although no mutants affecting this domain have yet been reported [49, 51]. Despite being completely resistant to RNAi generated by exogenous (in vitro synthesised) dsRNA or by endogenous (expressed hairpin) dsRNA, TbAGO1-/- mutant cells are viable, showing that RNAi activity is dispensable for procyclic trypanosomes in culture. Similarly, several mutants of the RNAi pathway in N. crassa, A. thaliana and C. elegans survive normally under laboratory conditions [2, 8, 9, 11]. A noticeable exception is found in A. thaliana where mutations in the AGO1 gene have severe consequences on both RNA silencing and development [49, 51]. In trypanosomes, detailed analysis demonstrated that TbAGO1-/- mutant cells encountered significant difficulties in cell cycle progression, resulting in reduced growth rate. Four lines of evidence indicated that the Argonaute protein is essential for mitosis and proper chromosome segregation in T. brucei. Firstly, the mutant showed a 20–30-fold increase of zoids and 1K2N cells, aberrant cell types typical of problems with mitosis such as those caused by the microtubule inhibitor rhizoxin [37, 38]. Treatment of WT trypanosomes with low concentrations of this drug selectively interferes with spindle formation, resulting in severe deficits in mitosis. However, mitochondrial genome duplication and segregation are not affected and cytokinesis can occur. This produces progeny with one kinetoplast but without a nucleus (zoids), and progeny with either one kinetoplast and one nucleus (if mitosis is completely inhibited) or with one kinetoplast and two nuclei (if mitosis is perturbed but not abolished). Significant production of zoids is also observed when mitosis progression is inhibited via RNAi targeting either cyclins or proteasome components potentially involved in cyclin control [52–54]. A delay in mitosis is further corroborated by the observation that, in the mutant TbAGO1-/- cell line, the proportion of 2K1N cells is increased, whereas that of 2K2N cells is reduced (Fig. 5B). Secondly, the spindle was frequently not recognisable in mitotic mutant cells and, when present, it exhibited significant defects in formation, being too short, without poles or bent. Thirdly, following mitosis, around one third of the binucleated mutant cells showed an unequal distribution of a nucleolar marker. Fourthly, and most significantly, FISH analysis revealed frequent chromosome segregation defects in TbAGO1-/- mitotic cells. Taken together with the presence of lagging DNA material and the frequent occurrence of apparently unequal DNA amounts in the two nuclei following mitosis, these data indicate significant problems in chromosome segregation and nuclear mitosis. It now remains to be seen whether these defects are related to the inability to carry out RNAi or to another function performed by TbAGO1. These results are reminiscent of those reported in the fission yeast Schizosaccharomyces pombe, in which genetic deletion of AGO1 (the only Argonaute protein) or RDP1 (a homologue of RNA-dependent RNA polymerase) or DCR1 (a homologue of Dicer) leads to chromosome segregation defects and a reduced growth rate [40, 41]. RNAi has recently been shown to be functional in yeast . However, it has not been reported whether any of these three proteins are involved. Intriguingly, AGO1, RDP1 and DCR1 are all essential for heterochromatin formation at the centromere, transcriptional gene silencing of this same area and proper centromere function [16, 56]. It has been suggested that the RNAi machinery is required to process non-coding transcripts from the centromere, targeting these genomic sequences for formation of heterochromatin mediated by histone H3 methylation and recruiting Swi6/HP1 followed by cohesin protein complexes [16, 17, 57]. These results are also supported by the sequencing of yeast siRNAs, revealing a significant abundance of centromere-derived RNAs . Defects in heterochromatin formation at the centromere interfere with kinetochore and mitotic spindle formation, probably explaining the mitotic segregation defects reported [40, 41]. Interestingly, csp9, a fission yeast mutant impaired in chromosome segregation and transcriptional silencing at the centromere  turned out to be an allele of AGO1 (cited as personal communication by R.C. Allshire in ). In T. brucei, one could imagine a similar involvement of the RNAi machinery in heterochromatin formation at the centromere, contribution to kinetochore assembly and chromosome segregation at mitosis. Unfortunately, centromeres have not yet been identified in trypanosomes and full sequencing and assembly of chromosomes I and II did not reveal any typical centromeric sequences [60, 61], thereby preventing direct testing of this hypothesis. One may wonder how the related kinetoplastid Leishmania behaves during mitosis, as the RNAi machinery appears to be absent . This situation is reminiscent of observations in yeast. Indeed, all the components of the RNAi machinery are present in fission yeast, whereas none of them have been found in budding yeast, although both genomes have been fully sequenced . This observation could be related to the striking difference between centromere structure in these two organisms . Similarly, trypanosomes and Leishmania separated a long time ago and could have developed separate systems to perform centromeric functions. Unfortunately the lack of information on centromere identity in both organisms prevents further investigation. Finally, there is little information about heterochromatin structure in trypanosomes, despite the fact that it appears to play critical roles in the control of gene expression . Understanding the mechanisms of heterochromatin formation will no doubt be a crucial advance in unveiling the complex mechanisms of gene regulation in the Kinetoplastida. We have identified novel Argonaute-like proteins in protozoa and demonstrated the essential role of one of them, TbAGO1, in RNAi in Trypanosoma brucei. Our data also reveal the importance of TbAGO1, probably via the RNAi machinery for proper chromosome segregation and spindle formation. Recent literature on the fission yeast S. pombe shows that AGO1 and two other components of the RNAi machinery are required for heterochromatin formation at the centromere and transcriptional gene silencing. Under these conditions, centromeres do not operate normally, leading to problems during mitosis. We postulate that a similar mechanism might operate in T. brucei, indicating the evolutionary ancient origin of Argonaute proteins involvement in RNAi and possibly in heterochromatin formation and centromere function. The procyclic stage Trypanosoma brucei brucei strain 427 was used throughout this study. Cells were cultured at 27°C in semi-defined medium 79 containing 10 % foetal calf serum at densities of 1–8 million per ml. The PTH cell line that expresses the tet-repressor and allows tetracycline-inducible expression  was cultured under the same conditions. The TIGR http://www.tigr.org/tdb/mdb/tbdb and Sanger Centre T. brucei databases http://www.sanger.ac.uk/Projects/T_brucei/, the L. major database http://www.sanger.ac.uk/Projects/L_major/, the T. cruzi database http://tcruzidb.org/, the P. falciparum database http://www.plasmodb.org/ and the G. lamblia database http://www.mbl.edu/Giardia were screened by BLAST search for the presence of Argonaute-like genes using the full-length sequence of the Paramecium PAP gene. Homologous sequences were identified and when required the genes were re-constructed. TbAGO1 and TbPWI1 were PCR-amplified using the high fidelity enzyme Pwo (Roche) and control-sequenced. Sequences were submitted to the GenBank database as AY433802 (TbAGO1) and AY433803 (TbPWI1). For expression of GFP::TbAGO1, a fusion gene was constructed in plasmid pGFPPFRC430 (P.B., unpublished). This plasmid is a derivative of pHD430  and contains the tetracycline-inducible EP1 promoter, followed by the EGFPN2 gene (Clontech) from which the stop codon was deleted, immediately followed by an XbaI site, in frame with the PFRC gene, followed by the 3' untranslated region of aldolase and by a cassette with the phleomycin gene resistance marker. The complete coding sequence of TbAGO1 was amplified by PCR with Pwo DNA polymerase (Roche) from genomic DNA using primers GCACGTCTAGAATGTCTGACTGGGAACGTGG (XbaI site underlined) and GCACGGGATCCTTATAGATAATGCATTGTTGT (Bam HI site underlined). The PCR product was cloned in pCR-Blunt-II-TOPO (Invitrogen) and the TbAGO1 coding sequence (including its stop codon) was cloned in frame with the EGFPN2 gene in the pGFPPFRC430 vector using Xba I and Bam HI sites to generate plasmid pGFPTbAGO1430. This plasmid was linearised with Eco RV and transformed in the PTH cell line that expresses the Tet-repressor  to generate a cell line that expresses the GFP::TbAGO1 fusion protein only in the presence of tetracycline (1 μg per ml). For TbAGO1 gene deletion, TbAGO1 flanking sequences were amplified by PCR with Pfu DNA polymerase from genomic DNA using primers CGCCAACTGTACACTCGTATT and TTTATTTAAATCCTTTTTATTAAGTTGCTT (upstream region, amplifying a sequence of 500 bp terminating immediately ahead of TbAGO1 start codon) and ACCACCGCTTCTCCGGGGAAAGCAA and ACCACGAAACTCACACTGCTGTCAG (downstream region, amplifying a sequence of 453 bp, starting immediately downstream of TbAGO1 stop codon). The full coding sequences of gene resistance markers BSD and NEO were amplified with Pfu (Invitrogen) from plasmid DNA using primers ATGGCCAAGCCTTTGTCTCA and TTAGCCCTCCCACACATAAC (BSD) or ATGCGCGAAATCGTCTGCG and TCAGAAGAACTCGTCAAGAAGG (NEO). PCR products were ligated and re-amplified using the PCR-ligation protocol as described  with a few modifications. We used bolting primers CGCCAACTGTACACTCGTATT (upstream region, position in the sequence: -466) and GAAACTCACACTGCTGTCAGC (downstream region, position in the 3' flanking sequence: +448) for amplification after the second ligation. Final products used for transfection were therefore composed of 466 bp from the TbAGO1 upstream flanking region, the gene resistance marker BSD or NEO and 448 bp from the TbAGO1 downstream flanking region. First, the first allele of TbAGO1 was replaced by transformation of wild-type T. brucei (strain 427) with the BSD construct followed by selection with 10 μg/ml blasticidin (Sigma). Resistant cell lines were obtained at the expected frequency and further transformed with the NEO construct to replace the second TbAGO1 allele. Cells were selected with 10 μg/ml of blasticidin and 15 μg/ml of G418 (Calbiochem). Double resistant cells were obtained at the expected frequency and analysed by Southern blotting. A transformant cell line was selected, subcloned by limited dilution and termed TbAGO1-/- cell line. For complementation, the TbAGO1-/- cell line was transformed with the pGFPTbAGO1430 plasmid and selected with 2 μg/ml phleomycin (Sigma), 10 μg/ml of blasticidin and 15 μg/ml of G418. Transformant cell lines were screened by FACS analysis detecting GFP fluorescence. To obtain tetracycline-regulatable expression of GFP::TbAGO1 in the knock-out background, this cell line was further transformed with plasmid pHD360 (linearised with Not I), that expresses the tet-repressor after integration in the tubulin locus . TbAGO1-/-+GFP::TbAGO1 Ti cell lines were selected in the presence of 1 μg/ml tetracyline, 20 μg/ml hygromycin (Sigma), 2 μg/ml phleomycin, 10 μg/ml blasticidin and 15 μg/ml G418. Transformants were screened by FACS analysis before being grown in the absence of tetracycline to select cell lines with optimal control of expression. In all cases, cell lines were subcloned before any detailed analysis. For measurements of growth rates, cells were always grown without antibiotics (with the exception of tetracycline when required) for at least 7 days before the experiments and for the duration of the whole experiment. RT-PCR was performed as described previously  using 250 ng of total RNA (DNA-free) and the following primers: ACGCCAAGCTTGGCGGTAGCGAAGACGCATTTG and GCACCCTCGAGACGCTCGTCGGATACTACCGCG (TbAGO1 segment from the nucleotide coding sequence 425 to 936); GCATCCAAGCTTCCATAGGTCGTTACTGTCG and CGTCGTCTCGAGCCACCGGAAGATGTGCCTGC (TbPWI1 segment from the nucleotide coding sequence 2228 to 2847). Northern blotting was carried out as described , except that DNA probes were radiolabelled by random priming. For Southern blotting, 20 μg genomic DNA was extracted from the various trypanosome cell lines and digested with the appropriate restriction enzymes, before separation on an 0.8 % agarose gel. Samples were transferred by capillarity to a HybondN+ (Amersham) membrane. The membrane was washed in 2x SSC, prehybridised in RapidHyb buffer (Amersham) at 65°C for 30 min and hybridised with radiolabelled probes overnight at 65°C. The membrane was washed twice for 5 min in 2x SSC and once for 20 min with 2x SSC, 0.1% SDS at 65°C. Radioactive signals were identified by Typhoon 9410 (Amersham) analysis and quantified using ImageQuant 5.2 software. RNA was synthesised in vitro with T3 and Sp6 polymerases using PCR products as templates. The following primers (incorporating T3 or Sp6 promoters) were used: for TbAGO1 (from the nucleotide coding sequence 604–903), AATTAACCCTCACTAAAGGGAGATCGTTGAACCCCAAAGAGAG (T3 promoter underlined) and ATTTAGGTGACACTATAGAAGAGCGCTCGCCGGATACTACCGC (Sp6 promoter underlined); for TbPWI1 (from the nucleotide coding sequence 2228–2848), AATTAACCCTCACTAAAGGGAGACCATAGGTCGTTACTGTCGT (T3 promoter underlined) and ATTTAGGTGACACTATAGAAGAGCCACCGGAAGATGTGCCTGC (Sp6 promoter underlined); for TbGRP1 (glycine-rich protein, from the nucleotide coding sequence 604–990), AATTAACCCTCACTAAAGGGAGACAGCGTGTGCAGGTGTCTGG (T3 promoter underlined) and ATTTAGGTGACACTATAGAAGAGCACCTTCTGACTGGCATCAC (Sp6 promoter underlined); for EGFPN2 (from the nucleotide coding sequence 476–691), AATTAACCCTCACTAAAGGGAGAAGAACGGCATCAAGGTGAAC (T3 promoter underlined) and ATTTAGGTGACACTATAGAAGAGTGATCCCGGCGGCGGTCACG (Sp6 promoter underlined) and finally PFRA (from the nucleotide coding sequence 1084–1358), ATTTAGGTGACACTATAGAGAGGTGAAGCGCCGTATTGAGGA (Sp6 promoter underlined) and AATTAACCCTCACTAAAGGGAGAGTTTTGTACAGGCGACGGAA (T3 promoter underlined). Amplified regions were selected to avoid cross-RNAi with any other sequence present in the T. brucei database . Single-stranded RNAs were mixed, heated at 90°C for 5 min and annealed in the RNA transcription buffer at 65°C for 30 min. Annealed dsRNA were sterilised by addition of 2.5 volumes of ethanol and 0.1 volume of 3 M sodium acetate (pH 5.0) followed by precipitation and resuspended in sterile water. Annealed dsRNA was introduced into trypanosomes by electroporation as described . For direct transfection assays, cells were transformed with PFRA, FLA1 or α-tubulin dsRNA, and returned to culture for 15–18 h before fixation and analysis by immunofluorescence. For dual transfection assays, cells were first electroporated with dsRNA from the gene to be tested, returned to culture for 10 hours and transfected with PFRA, FLA1 or tubulin dsRNA, grown for 15–18 h and processed as above. When GFP fluorescent proteins were used, cells were analysed by FACS (FACSort, Becton Dickinson) before transfection and immediately before fixation. For indirect immunofluorescence with the anti-PFRA specific monoclonal antibody L8C4  or with the anti-nucleolar antibody L1C6 (L. Kohl and K. Gull, University of Manchester, unpublished), cells were spread on poly-L-lysine coated slides and fixed in methanol at -20°C before processing as described . For indirect immunofluorescence with the anti-β tubulin monoclonal antibody KMX-1 , trypanosomes were fixed in 4 % (w/v) fresh paraformaldehyde in phosphate-buffered saline (PBS) at room temperature for 10 min, permeabilised for 10 minutes in 0.1 % Nonidet P-40 and processed as described . FISH was performed as described  except that probes were directly labelled with Alexa 546-dUTP (Molecular Probes). Slides were viewed using a DMR Leica microscope and images were captured with a Cool Snap HQ camera (Roper Scientific). Images were analysed using the IPLab Spectrum software (Scanalytics). We thank K. Gull and L. Kohl for providing the anti-nucleolar monoclonal antibody L1C6, C. Clayton for providing plasmids pHD360 and pHD430 and E. Charlier and H. Mitouard for technical assistance. We also wish to thank L. Kohl for help with sequence alignments and M. Gué for helpful discussion. Sequencing of T. brucei was carried out at TIGR and the Sanger Institute with support from NIAID and the Wellcome Trust, respectively. This work was funded by a CNRS ATIPE grant and by an "Aide à l'Implantation de Nouvelles Equipes" awarded by the Fondation pour la Recherche Médicale. M.D.-D is supported by a "Bourse de Formation Recherche du Gouvernement Luxembourgeois". M.D.-D. carried out all the experiments reported including database searches. P.B. conceived the study, participated in its design and coordination and wrote the manuscript.